Boyton was a cattle dealer prior to WW I. 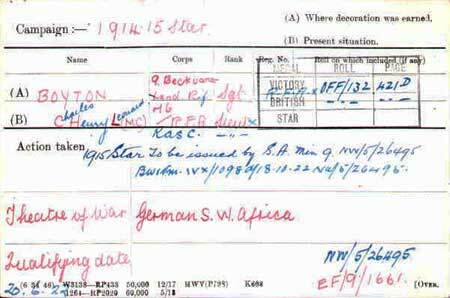 After a brief period of service in the BSAP Boyton served in South West Africa with the 9th D.M.R. (the Bechuanaland Rifles). 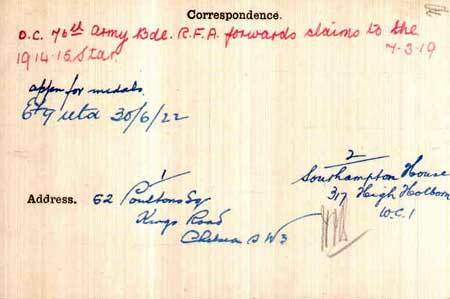 After the conclusion of the campaign, Boyton was recommended for a commission and joined the RFA. 1915 Dec 14. The undermentioned to be Second Lieutenants (on probation). Royal Field Artillery. Charles Henry Leonard Boyton. He subsequently served with 76th Army Brigade (3rd division) in France and Flanders. Boyton was wounded in the head by shrapnel (shell splinters) as a result of German counter battery fire at Langemarck on 4 October 1917 the first day of the 3rd Battle of Ypres. It is reasonable to suggest that Boyton's MC was awarded for action on 4 October, as he was evacuated immediately thereafter to England and did not return to active service. 1918 Mar 7. MC Gazetted 2nd Ly. Charles Henry Leonard Boyton, R.F.A., Spec. Res. For conspicuous gallantry and devotion to duty. When the battery was heavily shelled and gun-pits and dug outs blown in and men buried, he at once organized a party and started digging them out, continuing his efforts until all were rescued.